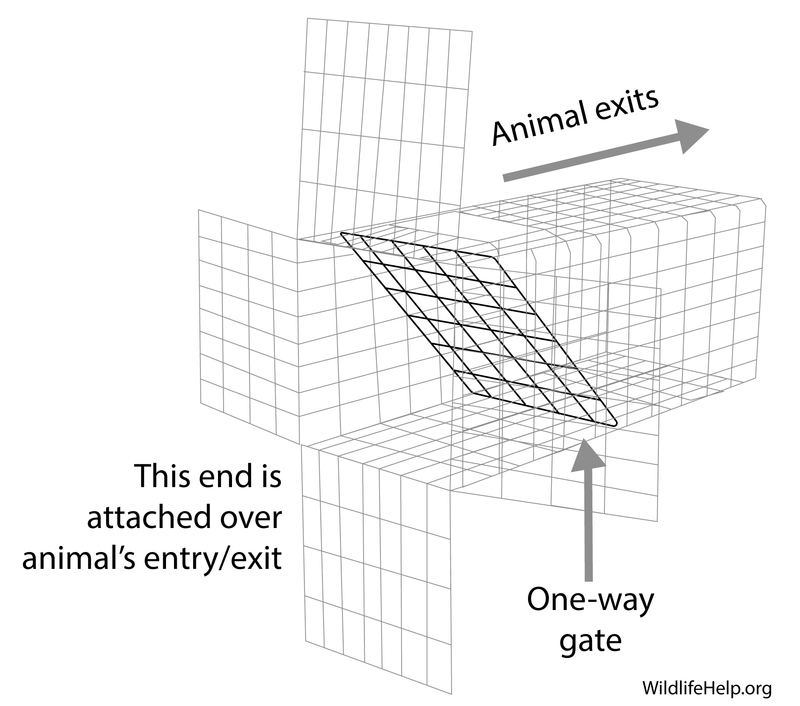 To let raccoons escape an attic or building, place an exclusion gate like this over entrances where animals are entering. Raccoons need only a 4-inch gap to enter a space. They find their way into attics at points where different building materials join, through attic vents, or by tearing off fascia or shingles. Raccoons can cause significant damage to homes and buildings by pulling apart vents, soffits, and roofing to get inside. Once they are in, they damage insulation, wires, and stored items and also contaminate insulation, ceilings, etc. with feces and urine. Due to the level of damage and associated safety hazards posed by raccoons living in and around homes, prompt removal is recommended. Breeding season should be taken into consideration when planning removal so that young raccoons are not trapped away from their mothers. If it is a female with young, wait a few weeks. After the young are weaned the mother and cubs may well move out on their own. Carefully inspect your house to determine all entry points; they will need to be repaired following removal of the problem raccoon(s). Cage traps can be effective for raccoon removal. Place them near entry points and bait them with fresh fruit, cat food, canned fish, or professional paste baits and lures. Because raccoons can carry rabies, they should not be relocated. You are encouraged to release trapped raccoons on the property where they were caught. Frightening methods may be effective. You may even be able to frighten them out by cautiously going into the attic or den area briefly presenting a threat like bright lights and/or loud noises at dusk just before their normal activity period. Professionals get pre-exposure vaccination for rabies since the raccoon is a rabies carrier; you might want to consider using a professional rather than risking a bite yourself. Mother raccoons will return for their young. You can carefully capture cubs with gloved hands or by using a capture pole/graspers. Place the young raccoons in a cardboard box, secured outside and near the entry hole, at dusk. Once the raccoons are out, seal all entry points. Cover all openings with heavy material, such as wire mesh, sheet metal, or metal flashing. Be sure to clean up any nesting debris and mess left by the raccoons. If you are dealing with raccoon feces, take care to avoid exposure to raccoon roundworm eggs. Raccoon roundworm can cause blindness, brain damage, and death. Ideally, hire a professional service to clean up raccoon waste. If you do clean up the waste yourself, the Centers for Disease Control and Prevention (CDC) strongly recommends you take care to avoid contaminating your hands and clothes. Wear disposable gloves to help prevent cross contamination. Wear an N95-rated respirator if working in a confined space to prevent accidental ingestion of eggs or other harmful materials. Avoid stirring up dust and debris by using a spray bottle to lightly mist the area. Wear rubber boots that can be scrubbed or cover your shoes with disposable booties so that you do not bring eggs into your living space. Material contaminated with raccoon feces should be removed and burned, buried, or sent to a landfill. Treat feces-soiled surfaces with a damp (but not wet) sponge and wipe the area with hot soapy water. Rinse the sponge frequently. After you are finished, flush dirty water down the toilet. Place the sponge in a plastic bag for disposal. Wash your hands thoroughly with soap and warm running water then take a shower and wash your hair. Clean/launder your clothes thoroughly with hot water and detergent.